No, that wasn’t supposed to be a question. Read the account below, which is taken from a BBC report. US-led forces say they have killed 26 militants in overnight operations in the Sadr City area of Baghdad in which four vehicles were destroyed. Troops also detained 17 militants in pre-dawn raids on the area, a Shia stronghold, the US military said. But Iraqi hospital and police officials put the death toll at eight and said civilians were killed in their homes. The raids are the latest in a series of US offensives against militants accused of smuggling weapons from Iran. 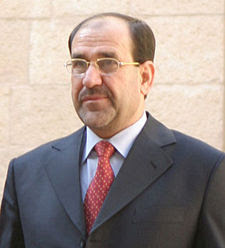 Iraqi Prime Minister Nouri Maliki criticised the raids on Sadr City, saying his government strongly opposed operations carried out by US-led forces without its permission. Never mind the BBC's anti-U.S. spin; that isn't what this column is about. I have ignored the Monday-morning-quarterbacking about whether we should have gone into Iraq, which deserves to be ignored, and I’ve tried to discount the more recent attitude against staying there, and even though I know intuitively and factually that the situation in Iraq is better than the media tells us it is, I am growing weary of this controversy. I find myself increasingly accepting of the suggestion that it is time for the U.S. to back off over there. I’m not saying, “Pull out,” nor am I endorsing the Democrat’s two-stage plan: 1 – Cut, and 2 – Run. But I am more and more coming to agree with the sentiment that the Iraqis aren’t holding up their end of the bargain. That sentiment just gained enormous strength with Prime Minister Maliki’s statement that “his government strongly opposed operations carried out by US-led forces without its permission.” (my emphasis) How’s that, again, Mr. Maliki? If you and the boys would get off your duffs and take control, you wouldn’t have to worry about such things. The last thing the U.S. needs is some do-nothing wimp criticizing it for doing what the wimps haven’t the courage or wherewithal to do. The danger of the U.S. backing off and leaving Iraq to the various factions to work out on their own is that those factions won’t be working things out on their own. Iran will have all of its fingers in the pie, as will other Middle East interests, and the future Iraq will be a detriment to peace and tranquility. Not that there’s much peace or tranquility in the Middle East outside Iraq, anyway. But enough is enough, and I’ve had just about enough of the Iraqi incompetence. So, Mr. Maliki, it’s all yours, ol’ buddy, and good luck with that F Troop you have to help you.